Tehran, 26 October 2005 (CHN) -- The restoration of the tallest brick dome of Iran will start in a near future by the restoration experts of the Cultural Heritage and Tourism Organization of the northern province of Golestan. 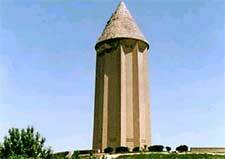 A tomb tower in Gonbad-e-Kavus in Golestan province is called Mil Gonbad, or Gonbad-e Qabus. This tomb tower was built by order of Shams ol-ma'ali Qabus ibn-e Woshmguir Al-e Ziyar, one of the Ziyarid rulers of Tabarestan (what is now the provinces of Golestan and Mazandaran), in the early years of the 11th century in order to be his tomb forever. In addition to being a brilliant warrior of his time, Qabus was well known as a poet, a philosopher, and a student of astronomy; his most famous book is Qabus Nameh. 72 meters tall, Mil Gonbad overlooks the plains of Central Asia from one side, and the Caspian Sea from the other. It can be claimed as the world's tallest brick dome. "The restoration plan of Gonbad-e Qabus is prepared by the restoration experts of the province and will be delivered to the Cultural Heritage and Tourism Organization of Iran in a near future," says Jebrael Nokandeh, , an archaeologist and expert of the Cultural Heritage and Tourism Organization of Golestan province. Today the restoration of the dome is an urgent matter, with humidity threatening many parts of the building. The Cultural Heritage and Tourism Organization of Iran is planning to inscribe it on the UNESCO List of World Heritage.